What inspired the sound and style of the band? 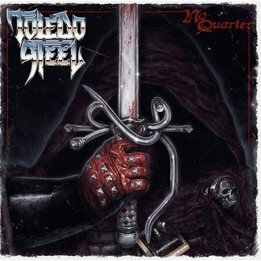 The sound and style of Toledo Steel was primarily inspired by a lot of the great rock and metal bands from yesteryear. Obvious names to mention are of course Iron Maiden, Judas Priest, Deep Purple and Saxon etc. There’s of course hundreds of lesser known bands that were equally inspiring to us but if I were to write them all out, the list would go on forever… haha! We always wanted the band to have quite a heavy hitting and in your face kind of sound! A sound that grabs your attention. How do you approach writing and recording, and how has that process evolved over time? We’ve never had a set formula when it comes to writing new songs. Sometimes a song is inspired by a chorus vocal melody idea and at other times it’s a cool guitar riff that sets the wheels in motion. Some of the tracks have even been written fully musically before working on the lyrics and vocal melodies last. When it comes to us recording as a band we often demo tracks ourselves to iron out the creases as best as we can before hitting the studio. Overall I wouldn’t say our approach has changed massively but we’ve certainly figured out what does and doesn’t work for us as a band. Do you prefer playing live or in studio? There’s no doubt about it, we prefer to play live! The studio is exciting too and always a positive challenge to really push ourselves but we feel that the live show is the best representation of the band. After having built up such a following over the years, what’s the most exciting thing you’re looking forward to with this new record? We simply can’t wait for as many people to hear it as possible. It certainly feels like a step forward in terms of songwriting, performances and production. People who’ve liked our other recordings should enjoy the album but we hope to gain more exposure and new listeners along the way also! Playing the new material live and promoting the album is what we’re really excited about though of course! How did you approach writing this new record, are there any themes that are present in it? As already mentioned in question 2, the writing process varied from song to song. We tried to capture different themes on the album with regards to the lyrics and feel of the songs musically because we wanted to include variety but retain the Toledo Steel sound. I wouldn’t say that there’s any recurring themes because each song has a entirely different lyrical concept. Our future plans are to continue writing new music, release subsequent albums and gig as much as we can! Simple! We want to play as many new places as possible and spread the Toledo Steel sound far and wide. They are one of the hottest bands in the British Metal scene today alongside Seven Sisters, and after years of hard graft, their debut album is finally here. It starts strongly with Behold The Machine, a thumping masterpiece of guitar licks and eastern influences, the song is classic metal. A driving rhythm keeps things hot and tidy during the song as vocalist Richard Rutter bellows his heart out. A solid start. No Quarter is a big number, the driving riffs set the scene quite nicely, the lead lick over the main riff creates the sense that this is going to be another epic number. The vocals are precise and hair raising, Rutter really shines through on this song. Cemetery Lake is epic, big fat riffs, and a pounding rhythm that keeps things going, the song takes the listener on a very interesting journey that includes some very nice interplay from Tom Potter and Josh Haysom, the guitarists. Visions In The Fire is a slow groover, a song that kicks off with a bass lick before bringing that classic metal one-two riff that Judas Priest made famous. Another blinder of a song. Rock Nights is a grooving song, with a jagged riff, and some searing heat from the bass and drums. The vocals craft themselves quite nicely around the main riff, ensuring that the listener is given a real treat. Sight Of The Sniper is fast, the riffs are moving and shaking throughout the song, the rhythm section keeps the listener hooked and desperate to know more. Heavy Metal Headache is pounding, searing and grooving a song that will surely get the crowd singing. When The Night Draws In is furious, a song that brings big riffs, grooving rhythms, and a searing vocal line, a song that has the makings of a closer all over it. This is a fabulous album, a real gem. Be sure to get it when it is released on June 1st via Dissonance Productions.